When Ramla was founded during the Moslem era in the 8th century AD by Suliman Abed al Malik, the district governor, it was vital to supply the town’s residents with water. The closest source are the Tel Gezer springs. It was necessary to construct an aqueduct that would carry water from the springs to the water reservoirs in town. The water conduit was built from lime stone and plaster, at an average width of 50 cm and at a height of up to 1.20 meters. Every few meters, a control shaft was constructed which enabled to maintain the aqueduct and remove clogs. 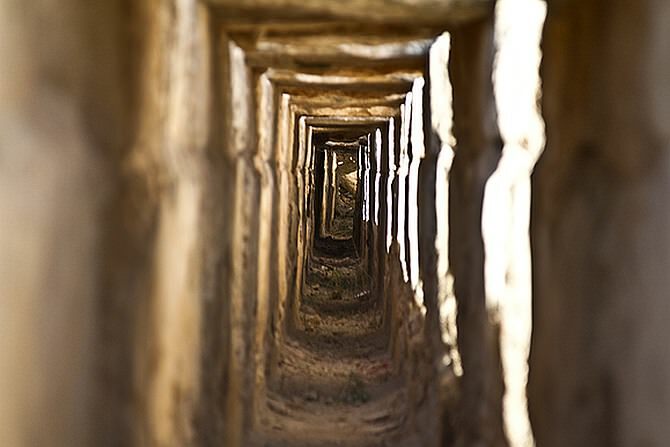 Although according to its architectural features, this aqueduct is of a typical Roman style, research revealed that this is indeed an Arab water conduit from the 8th to the 10th century AD. An initial estimation of the aqueduct’s capacity which is based on the results of excavations (the aqueducts diameter and inclination), disclosed a potential capacity of hundreds of cubic meters per hour. On the aqueduct’s wall, there are signs of Travertine (scale) which bear witness to the height of the water inside the water conduit during its operation. According to the signs of the sediment to be seen on the walls, it is possible to calculate the quantity of water once flowing here, and this quantity stood at 17,000 cubic meters per day during peak times (the flow rate of the springs is higher in the winter than in the summer). Apparently, the aqueduct stopped functioning in the 10th century AD, maybe due to the siege of Ramla in the year 976 AD. 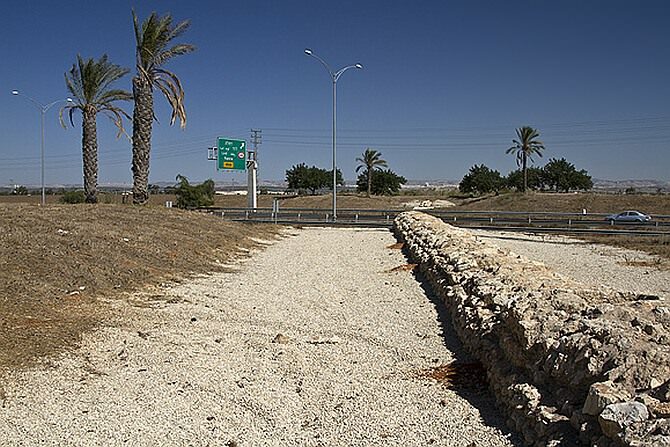 The remnants of an additional aqueduct were discovered when Highway 6 was built. Subsequent to the discovery of these ancient remnants in the months of July and August 2001, excavations were carried out about 1.5 km east of Kibbutz Na’an. 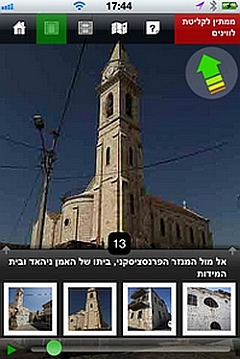 The excavations were conducted out by the Israel Antiquities Authority and funded by the “Derekh Eretz” association. 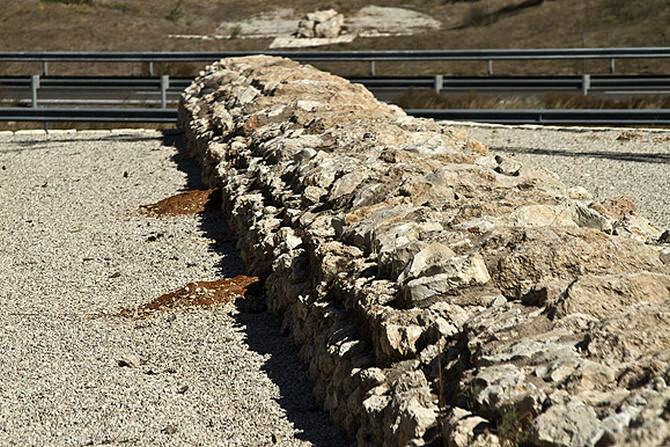 Today, the Ayn Yarda spring east of Tel Gezer does no longer supply these large amounts of water, and due to its location, it is not probable that it is the source of the water that was carried by the aqueduct. In the course of investigations conducted in the area, six springs in the surroundings of the village of Abu Shusha at the foot of Tel Gezer were discovered. Today, their capacity is low, but is makes sense to assume that it was much higher in the past. As it turns out, the waters of several springs were collected in order to justify the construction of a water supply system to provide water to a capital city with thousands of residents. As it seems, this aqueduct stopped working altogether in the 9th or 10th century AD (according to the estimate of Dr. Shimon Gat), due to an earthquake.